Successfully Added ID Card Camera - Ultimate Hidden Digital Camcorder to your Shopping Cart. For undetectable and inconspicuous covert surveillance, look to the ID Card Camera. The small pinhole camera inside secretly records high quality video, audio, and takes instant picture snapshots without anyone ever knowing. With an ultra-thin 5.3mm thickness and ID card design, this ID Card Camera makes for the perfect portable covert surveillance device. 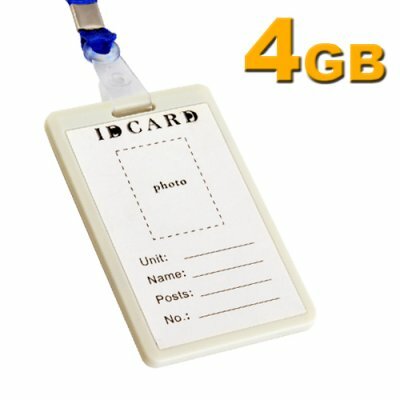 Just hang it around your neck like a normal ID card (or clip it onto your clothes) for access to one-button video recording, audio recording, and picture snapshots. This device is ideal for citizen journalists doing undercover video recording, activists trying to capture evil companies dumping toxic waste, or anyone wanting to look like a company employee while secretly working to take down "the man". This ID Card Camera comes with a huge 4GB of internal memory that is enough for over 15 hours of video recording, 50 hours of audio-only recording, or over 6,000 picture snapshots. Also includes plug-and-play functionality so you can easily access your recorded files on your computer. This unique ID Card Camera is the latest style in covert surveillance and is one smoking hot gadget. Available in our warehouse right now, order today and we'll ship it out tomorrow. Brought to you by Chinavasion, the leader in Wholesale Electronics and Gadgets. Comes with everything you need (including a neck strap) so you can use it right out of the box! 4GB memory is able to store many hours of high quality video or audio recording, and thousands of pictures! Can I stick my own custom sticker onto the ID Card? Of course! Just make sure you leave a small hole for where the lens is. For file transfers, it is plug-and-play and only works on the operating systems listed in the Manufacturer Specifications. this one is easy to use and works very well. Photos and vids are pretty clear for such a compact device. When I got this product I was annoyed that they had a sticker on it (more provided in the box). The sticker makes the gadget look really fake, I removed mine and printed something more realistic instead. The USB flap is hard to open and easy to loose. When it comes to video quality this thing shines, excellent quality but it's not so hot in dim lighting conditions. Two hours of continuous recording. The belt clips that come with the product is crappy and prone to popping open so avoid using it. Overall a good solid product.